Fan-constructed stories manifested in the form of a game. 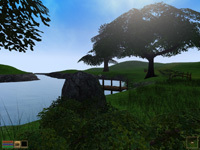 Some are an attempt to explain some of the "mysteries" of Ultima, others are purely for entertainment, but all are an imaginative enhancement of the Ultima world. The Avatar has just escaped the desolate world of Pagan and is facing the Guardian's mountainous monument when suddenly he is granted with a vision of the Dark Core of Exodus. Slowly, the Avatar feels himself pulled into the Core, and it looks like the Guardian may have been pulled in as well! Or is this just another one of his tricks? A New Breed of Dragon's creative interactive fan fiction will send you on a quest through the Dark Core in the first-person 3d-rendered style of Myst. Play over the web as a Java applet or download and play on your PC. Very little details have reached us about the backstory for this project other than the fact this game is set to take place immediately after the Ultima 9: Redemption remake. So the story goes, the authors of these two projects got in contact with each other, decided to collaborate on mod creation and merge their two games to share the same mod data. At present, the game is not being worked on and development will not begin until Redemption is complete. It is slated to use the Oblivion engine. The Feudal Lands is an ambitious Exult mod-based project aimed at adding a third Sosarian continent, the Feudal Lands (formerly the Lands of the Feudal Lords in Ultima I) as well as combining Ultima VII: The Black Gate and Serpent Isle into one seamless game under Exult. In the Feudal Lands you will assist another on their quest to become an Avatar. Furthermore, the mod will incorporate all Geometrodyanmic Dragon's patches (which consist of the Blackgate Keyring mod, Serpent Isle Fixes, and the Avatar Pack). For more information on this project, read this thread on the Exult forums. Withstand the Fury Dragon is creating a Worlds of Ultima fanfiction game based on the events in one of the other lost continents of Sosaria, the Lands of the Dark Unknown. It chronicles the adventures of some of the Avatar's companions, Segallion, Sentri, and Gorn, as they travel here to learn that the Forces of Order (formerly of Serpent Isle) are being lead by the Guardian and are conquering the continent as a means of entering Britannia. Check out the project site for the complete backstory. Note, this project also used to include Lands of the Feudal Lords as well, but this has been dropped so as not to conflict with The Fuedal Lands, to lessen the scope of the project, and also to accommodate the loss of most of the original game data in a hard drive crash.